As residents of Malibu fled their seaside city in droves to escape a raging wildfire on Thursday, volcanologist Jess Phoenix hitched her two-horse trailer to her Ford F-250, hopped on the 101-freeway, and headed straight for the inferno. There were animals that needed rescuing. As a trainer and proud owner of two horses, Phoenix knows a thing or two about helping the animals out in difficult circumstances. As a scientist who’s done field work around active volcanoes, she knows her way around a fiery disaster zone (although fires and volcanoes are different). And as an Angeleno deeply embedded in Southern California’s equestrian community, she knew that some of the more than 100,000 people ordered to evacuate as the Woolsey and Hill fires tore through Malibu and surrounding areas on the night of November 8 had equine companions in need of help. In other words, driving into the smoldering heart of horse country as flames raced down the hillsides wasn’t much of a choice. 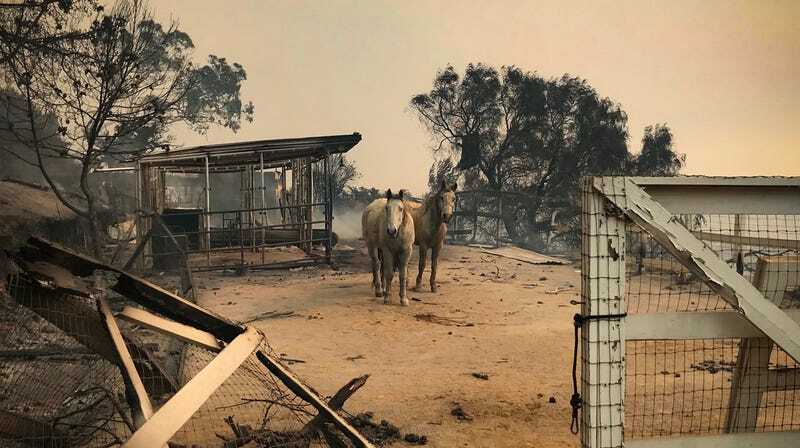 Phoenix is part of Southern California Equine Emergency Evacuation, a 13,000 member-strong community of horse lovers who have space to shelter the animals or trailers to pick them up in, and who’ll come to rescue when disaster strikes a community. On Thursday night, she evacuated four horses, starting in the city of Agoura Hills and then moving west into the rugged equestrian community of Hidden Valley in the Santa Monica Mountains. Those four pickups alone took all night. Fortunately, there were a number of folks out helping evacuate animals, including trained volunteers like Phoenix and professionals with Los Angeles County Animal Care and Control and Ventura County Animal Services. Along with horse owners who were able to evacuate their animals themselves, rescuers were soon flooding into designated animal shelters like Pierce College in the west San Fernando Valley. The college campus, which includes a 225-acre farm, has for years served as a shelter during the fires that so frequently plague the region, and its staff was ready. When Phoenix dropped off her first rescue horse at Pierce College on Thursday night, the shelter was nearing capacity. Soon it was overflowing with more than 250 rescue animals, Clay told Earther. In the days since the fire flared up many folks have taken their animals home, but as of yesterday morning, there were still 153 horses and 20 mini horses, along with donkeys, goats, sheep, chickens, and tortoises. The nearby Hansen Dam Equestrian Center, also a designated shelter, was similarly slammed. Northwest of the fires near Oxnard, the Ventura County Fairgrounds and the Humane Society of Ventura County started picking up some of the overflow. Greg Cooper, Director of Community Outreach at the Humane Society, said that his private non-profit jumped to 24/7 emergency services “within an hour of the first fire,” with equestrian teams heading out to rescue horses, donkeys, cows, and other livestock in the Malibu area. That included pulling animals from Zuma Beach, which became a temporary refuge for horses, llamas, and a now internet-famous pair of alpacas. Cooper told Earther that the Thomas Fire, which tore through Ventura County last year and became the largest fire in California’s history until the Mendocino Complex unseated it this summer, provided practice for the rescue teams. Cooper said the Humane Society would continue sheltering animals and providing 24/7 care “as long as it takes.” Randy Freeman, marketing manager at Ventura County Animal Services, echoed that sentiment regarding the temporary shelter at the county fairgrounds, which was sheltering 180 horses, ponies, and other large animals as of Tuesday night. A miniature horse on a beach near Malibu. The animals may need help a while longer. As of Tuesday, the Woolsey Fire had torched nearly 100,000 acres, destroyed an estimated 435 structures and claimed two lives, according to Cal Fire. Full containment is expected by November 18, but even as thousands of people start to return home, recovery will be a long, painful process for many residents and their animal companions. At least one ranch—White Cloud Ranch in Malibu—burned to the ground, although, thankfully, all 48 horses and ponies were evacuated. The bright spot amidst all the horror is how the community came together to help one another, and nowhere is that more evident than in the mass mobilization to rescue creatures that cannot rescue themselves. “I have to tell you, the community has been amazing,” Clay said, recalling how volunteers with the animal welfare organization Operation Blankets of Love showed up with supplies and stayed on campus for three days to help the small animals. In addition to the local vet the school partners with, a volunteer vet showed up out of nowhere to lend a hand, too. Phoenix said that as designated shelters became full Thursday night, private barns across a wide area started making themselves available. “People were driving these animals 70, 80 miles away from the fire,” she said. She also made her home available for people and animals—the calculus was simple. “It will be everybody’s turn sooner or later,” Phoenix said. Correction: This article incorrectly identified Jess Phoenix as a horse breeder. She is a horse trainer. We regret the error.